That is the best word I can describe him. He was quiet. Well, he did not say anything unnecessary. He knows what to say at the right moment. Enzo Marsicovetere was a Guatemalan kenshi. I met him in the year 2000. 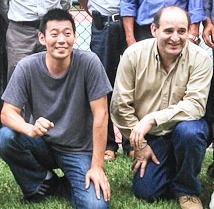 I was sent by Japan International Cooperation Agency (known as JICA) as a volunteer to teach kendo in Guatemala. I was their second volunteer. Even though Enzo did not hold the highest grade in the Guatemalan kendo association, he was definitely their leader. Everyone respected him as a senior kendo student or senpai and their friend. And of course, he carried passion toward kendo. My goal in Guatemala was to train those guys as instructors so they would not have to ask for more volunteers. They could train the next generation by themselves and then when they could they could go out and learn more kendo. And I only had two years in Guatemala. So I trained them very hard. Enzo was already in his mid-30s and I made him train like a high school student. Training was centered on tons of kirikaeshi and uchikomi. That was all. Like I said, he did not say unnecessary things. He led his fellow kenshis by his example. He was not the highest in grade but not the youngest either. But he did not give up. He did not even complain about training because of his age. He was there all the time and he encouraged his kendo mates. Enzo at far right on the second row. They had more than 15 or 20 members when I got there but when I left, there were only 5 or 6 members left. 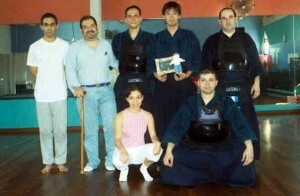 And these members became the core of Guatemalan Kendo. He was not very quiet in kendo though. His kendo was straight. He did not do anything to get a point. His strikes were always committed. It was the kendo of the man who knew when to “throw” himself at his opponent without hesitation. He was a successful business person, good husband and very nice father of 3 beautiful children. I looked up to this man. And one day, I wanted to become like him, successful and a good father. I am not even close to him. He was loved and still is. I loved the way he made jokes. I loved the way he was goofing around. I loved the way he giggled. I loved the way he was thinking seriously. I loved when he said to me, “no worries, mate!”, because of my New Zealand background. There are tons of memories of him in me, Guatemalatecos and many others. Your legend will go on. You will be with us like you have been. Rest in Peace, Enzo. Left for His New Journey on February 5, 2015. Well said. The heart of many, seniors as I am, youngsters, those with handicaps or ailments, resided in this man. It is not always the physical abilities but the spirit that carries one on in kendo. The try, the effort, the want. Often coupled with the need and the peace it grants. God grant him peace, and fellow students rememberance. Thank you for your message, Eric.